iRevelar is a veteran and minority owned business. iRevelar is experienced in managing and mitigating responses to security, investigations, threats, and analysis for law enforcement, military and corporate partners. Special investigations experience in fraud, auto theft, cyber/identity theft, and fire and arson investigation. We at iRevelar offer free consultations to walk you through your needs, the scope of your goals, and your budget. August is a National Security and Investigations professional experienced in managing and mitigating responses to security, investigations, threats, and analysis for military, law enforcement and corporate partners. 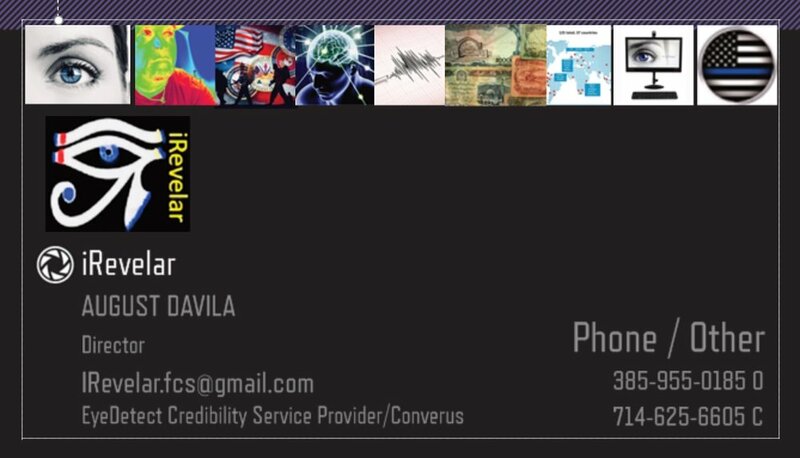 He is Director at iRevelar Forensic Credibility Solutions, a service provider for Converus. He works closely and collaborates with law enforcement agencies. August is an accomplished SME in HUMINT exploitation and analysis and served the Department of the Army for over 15 years in operations, exploitation, analysis and collection. He was Training Manager and Course instructor at HT-JCOE JAICC exploitation course. August has also provided National Security expertise while on deployments to Afghanistan. He is a veteran of Operation Iraqi Freedom and has had multiple deployments to Afghanistan. Masters Degree in Strategic Security/Terrorism and Counterterrorism Studies degree. Gonzalo Wilches has 20 years professional experience in national security, force protection, insider threat, threat mitigation, vulnerability assessment, and international terrorism. He has worked with government agencies and military in response to security needs. He was part of an advisory team and liaison while working overseas. Mr. Wilches holds a Masters Degree in Bioethics, and Psychology. He has worked extensively in this field abroad and locally. He is fluent in Spanish and English. Josh has over 25 years of experience in Geographical Information Systems (GIS) and Global Positioning Systems Technology (GPS). Joshua attended Ball State University where he earned a Bachelor of Science in Geographical Information Systems with a focus on GIS, Remote Sensing and Cartography. His career milestones involved working closely with local government, utilities, transportation, telecom, environmental firms, US Department including the Army, Navy, Air force, Marines and Special Forces. His expertise is in mapping, training, selling and supporting solutions involving Software as a Service (Saas), Autonomous Vehicles, LiDAR, Infrared (IR), Web-Based Mapping Platforms and sUAS Systems. He launched 111 West Drones in 2014 and the United Drone Network in 2016. He earned his FAA Part 107 Certification in 2016.